Renoir had by now found some patrons. An influential one was the publisher Charpentier, in whose garden The Swing had been painted. Renoir was beginning to find portrait commissions too, and in order to further these Madame Charpentier commissioned Renoir to do a portrait of herself and her two little girls (see painting above ).It was submitted to the Salon of 1879 and because of the social prominance of the sitter it received a good position and was a success. Renoir set about deliberately in the portrait of Madame Charpentier to paint a picture that would please conventional taste without prostituting his talent. Renoir did not regard it as a lowering of standards or a denial of principles to modify his impressionistic manner to accord more closely with Salon standards. The result was a fine portrait even if it is not Renoir's most exciting work. SPECIAL NOTE : The painter will make the reproduction as close to the original oil painting as possible. 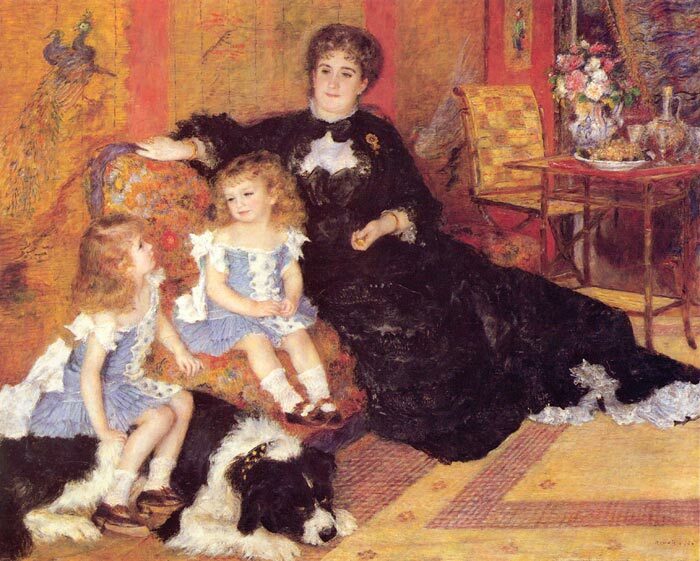 If you want your painting to alter from this likeness, please email us and " Madame Charpentier and Her Children, 1878 " will be reproduced according to your special requirements.